The increased incidence of malignancies associated with AIDS has been the subject of several reports in the North American literature: besides Kaposi’s sarcoma and other tumours, such as squamous carcinoma of the tongue and cloacogenic carcinoma of the anorectum [1–22], malignant lymphomas have been demonstrated to be one of the major problems among the neoplastic complications of AIDS [12–24]. 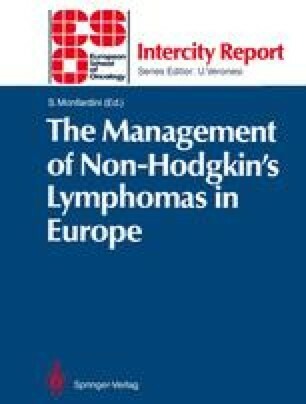 According to the North American experience, non-Hodgkin’s lymphomas in patients with AIDS or AIDS-related clinical conditions present at an advanced stage in which lesions are concentrated in extranodal and often unusual locations, notably the CNS. Disease confined to the lymph nodes is uncommon. These lymphomas are predominantly high-grade B-cell neoplasms classified as immunoblastic and Burkitt’s-like lymphomas. A variety of severe opportunistic infections and Kaposi’s sarcoma affect these patients. At the same time, the association with AIDS is strengthened by the regular demonstration of reversed ratios of helper (T4+) and suppressor (T8+) lymphocytes in the peripheral blood and by the presence of antibodies to human immune deficiency virus (HIV) . The prognosis is dismal: response to chemotherapy does not positively affect median survival. Mortality rates analysed by histological grade are higher than the currently reported rates for comparable patient populations .